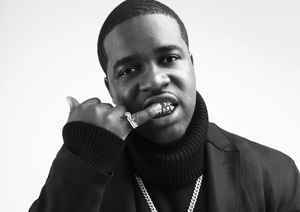 Darold D. Brown Ferguson, Jr. (born October 20, 1988), better known by his stage name ASAP Ferg (stylized as A$AP Ferg), is an American rapper from New York City's Harlem neighborhood. Aside from his solo career, he is a member of the hip hop collective A$AP Mob, from which he adopted his moniker. In January 2013, Ferg signed a solo record deal with Polo Grounds and RCA, the same labels that helped launch A$AP Worldwide, when Ferg's A$AP Mob cohorts A$AP Rocky and the late A$AP Yams, negotiated their own respective deal in 2011. His debut album Trap Lord was released on August 20, 2013, and was met with generally positive reviews. On April 22, 2016, Ferg released his second studio album, Always Strive and Prosper.